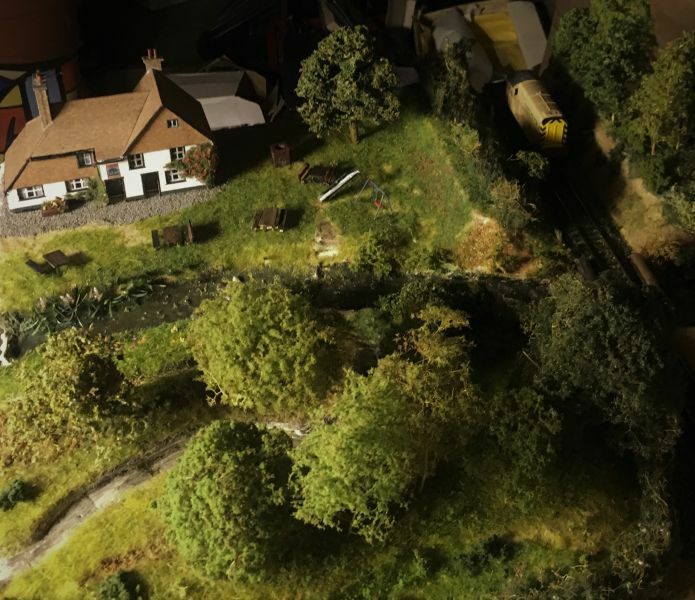 This is the start of my first "proper" layout, The Faversham Creek, based on the Kent market town of Faversham. Originally, the Faversham line ran on the Chatham line to London, but was later extended to Whitstable and then Herne Bay. The plan was to extend it to Ramsgate and then join up with the Southern Railway and return to Faversham via Canterbury, creating a lovely loop. I would love to have the space to model that, but sadly I do not!! Nor did the loop ever happen! 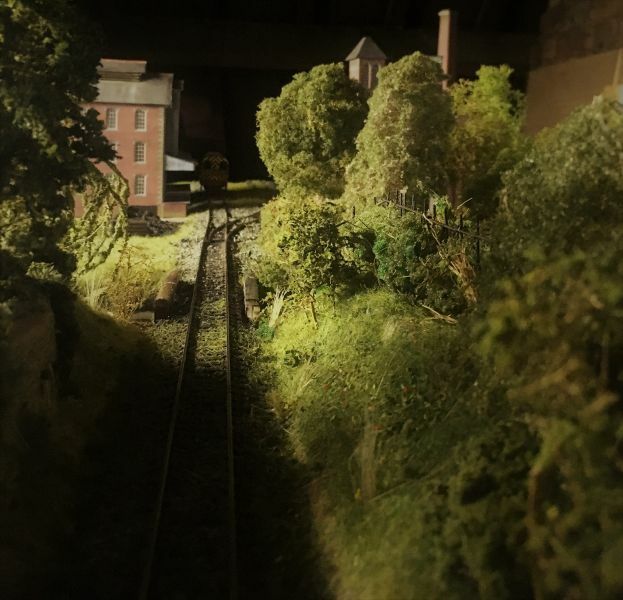 However, Faversham also had a branch line that ran to the creek, a busy little harbour famous for its exports of bricks, cement, fruit, cattle, gunpowder and beer. The Shepherd Neame Brewery is the oldest exporter of beer in the country - at least as old as 1669 - still producing on its original site. I can personally recommend both its 1669 ale and its famous "Spitfire" bitter!! 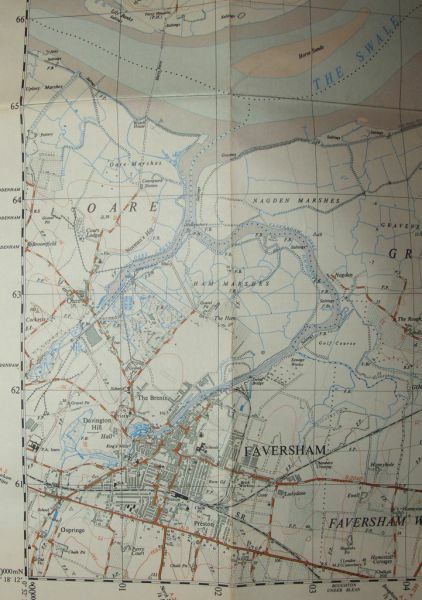 I now live in Faversham, but there is a long family history here, on my mother's side. My grandfather was the last horse drawn drayman at the brewery, taking over from his father who was tragically killed by one of the horses. My mother lived here during the war and was regularly bombed and on one occasion, machine gunned by a Messerschmitt! She gained a little fame by identifying the last two unknown airmen of the second world war, and their crash sites, after a number of archaeological digs, and became an honorary member of 603 squadron. So "Spitfire" beer has a special place in my family's hearts! In fact the Shepherd Neame T-shirt, emblazoned with "No Focke Comes Close” has almost become the unofficial garment of the surviving pilots!! My father was a Cornish blacksmith who moved from the South West to work on the Kentish railway after his national service (in Paris) and although he was based at Ashford, he regularly worked at the simple coach repair works at Faversham. Obviously he would prefer that I modelled “down home”, but Faversham is an agreed compromise and an area I at least know! 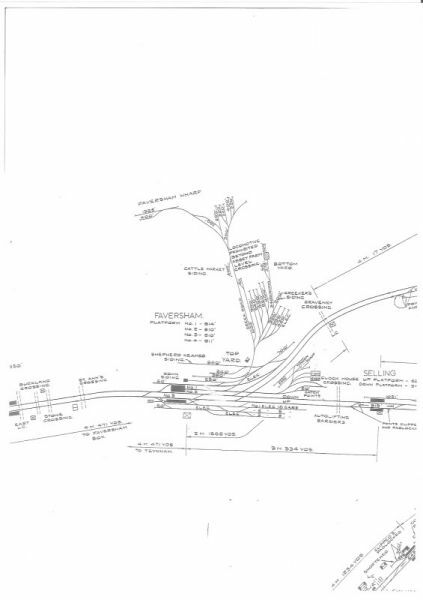 Anyway, the line from Faversham to Whitstable was built before the branchline to the creek. However, ideally, the line would have run from Faversham Town, to the Creek and then on to the coastal towns. Google Earth shows that this track was a near perfect oval - perfect for my needs. So, I imagine that the track did indeed run in an oval to the creek before running on to the mainline to the coast, while at the other end it travelled to London. My intention is to build this proposed line - a busy mainline station (somewhat truncated) with a branchline to the busy creek. Most of the industries, except for farming and beer were closed before the 60s, but I might imagine that they had continued to prosper, thus giving me plenty of freight opportunities too. And some shunting! 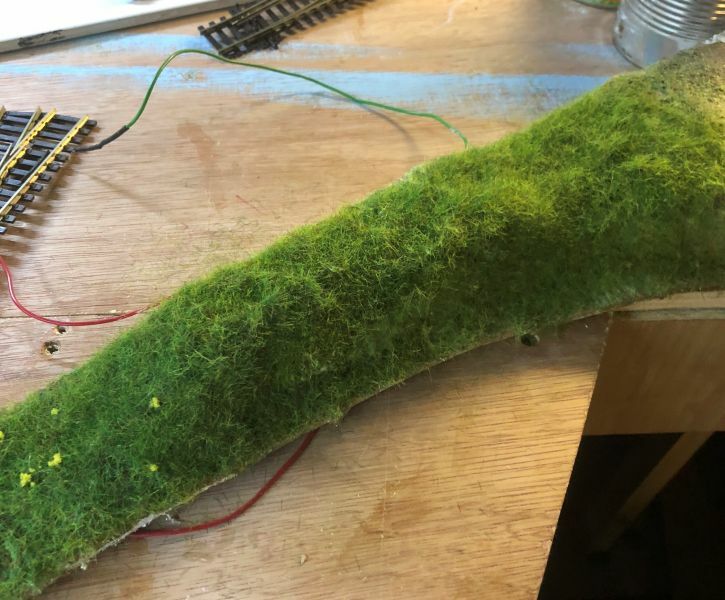 It will not be a prototypical model of the area, but an imaginary "what if..." And in the 60s it was experimenting with electrics and diesel as well as the end of steam and the southern ports meant that there were all sorts of locomotives in operation, so I can pretty much run whatever I fancy!! Perfect! I will keep you posted on my progress, but it will be a marathon, not a sprint as SWMBO seems to have plenty of other plans for me. And then there is the granddaughter!! Looking forward to progress reports Michael.It sounds like you've finally found your mojo. Great story board. Looking forward to more. 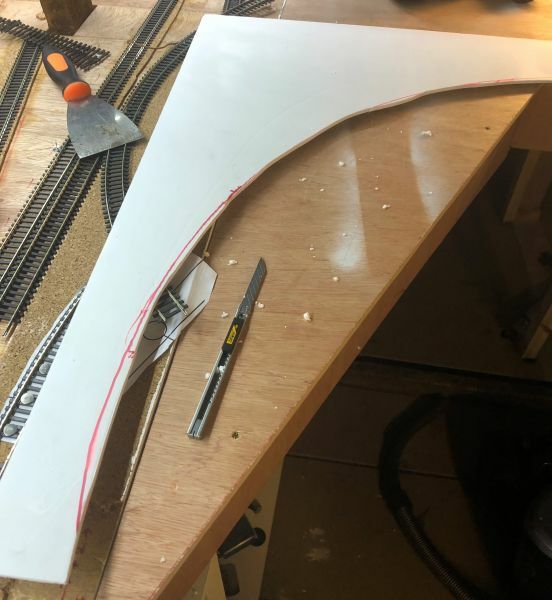 Well, It's been a while since I gave the outline of my proposed layout, but real life seems to get in the way, doesn't it? However, I have made some progress, so thought I ought give a bit of an update. Baseboards and storage have all been completed and the track plan drawn a thousand times, but I think I have what I want now. 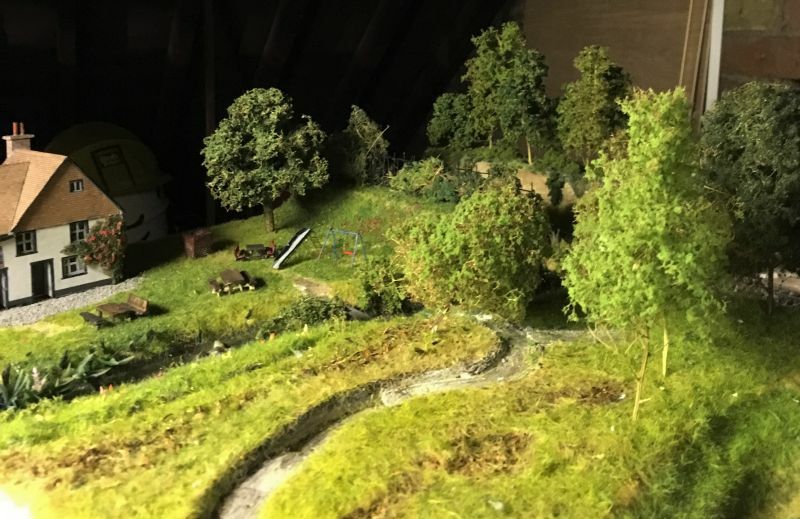 The real life Faversham Creek proved to be too much for my scale and room available..... but then I was always re-imagining it anyway. So I have simplified the history, reduced the number of sidings and flipped the real railway 180 degrees and imagined it continuing on to the coastal route. 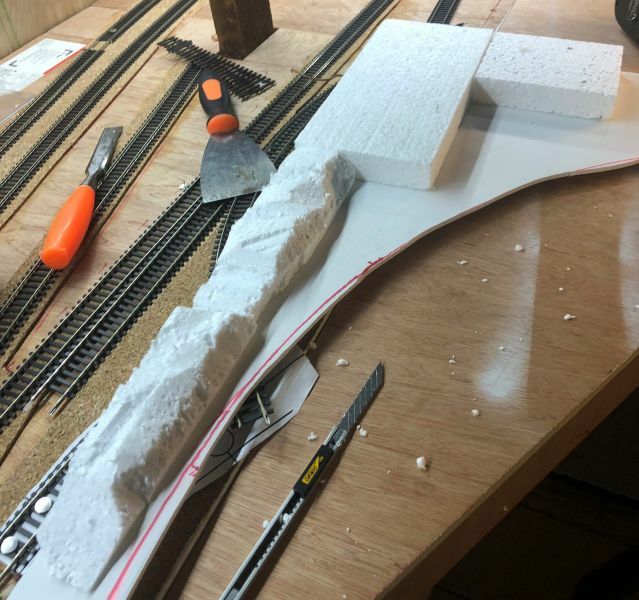 I have laid out the mainline and a couple of sidings, but the way I have designed it means I have a very tricky corner which I won't be able to access easily once everything else is built. I have designed a lift out scenic unit so I can always get to track and locos if needed, but I have been testing and testing in the hope that it will not be a problem! Famous last words! So, although pretty much everything is in a temporary state, I have had to start the scenic in my tricky corner. I wanted to have some sort of theme hidden throughout the layout, and have decided on literature. Each scene will, I hope, reflect, hint at or downright copy something from novels I have read. Although one or two movies might sneak in too! It works in black and white too. I once read that if black and white looks better than colour, then you probably have your colours wrong. Hopefully you will agree that both photographs look ok! Please excuse the beam at the top of the picture, I didn't bother to crop it...… I'm a loft dweller! I have just re-read my opening post properly, so ought give a bit of an update. The mainline station of Faversham is now "off scene". 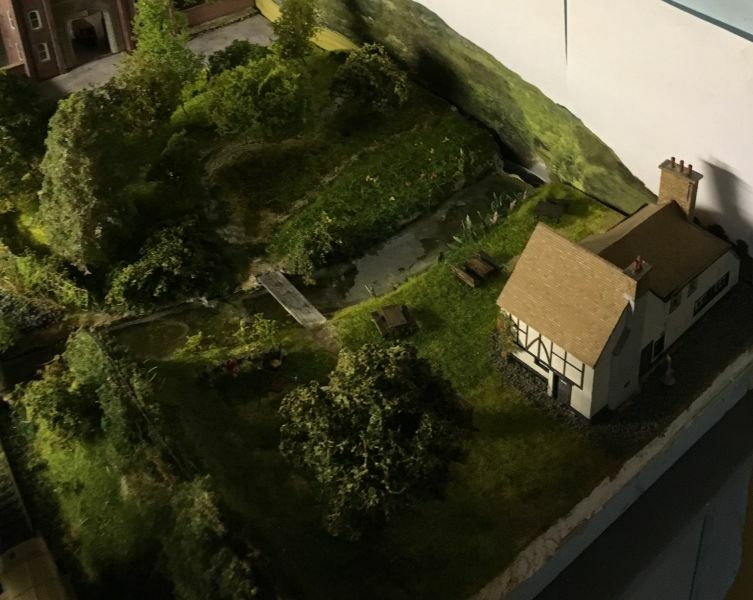 The plan is to show the beginning of the town, it's church and some housing, but the actual station will not appear (trains will disappear to the fiddle yard which will effectively be the "station", but not a feature). The track will therefore follow the route of the cutting, past the brick works and some open countryside where the Abbey buildings were (although, miraculously, the Abbot's House has survived in my plans and is now an hotel!) and down to the creek for some nice scenes of Standard Quay. It will then progress, off scene once more, towards Whitstable. So, in effect, while the real route turns to the left at the creek, mine will turn to the right and so can go off to the existing mainline, all of which is off scene, but allows me to have a large oval track. 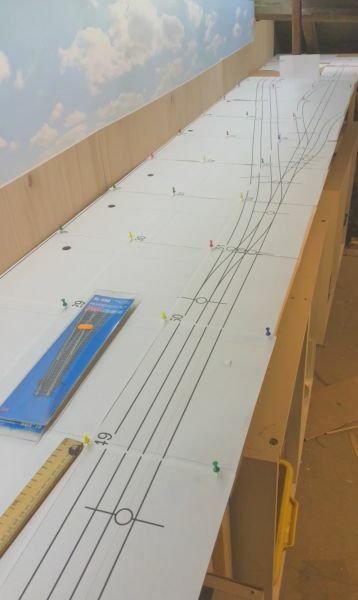 The length of the run is about 5 metres, with a 2 metre turn at each end into the fiddle yard. The virgin and the gypsy scene looks fantastic and blends in very well with the backscene. I love static grass and the realism it can bring, but I've learned from small modules I have made previously (as I tried to learn some skills) that it can easily look like a lawn everywhere. 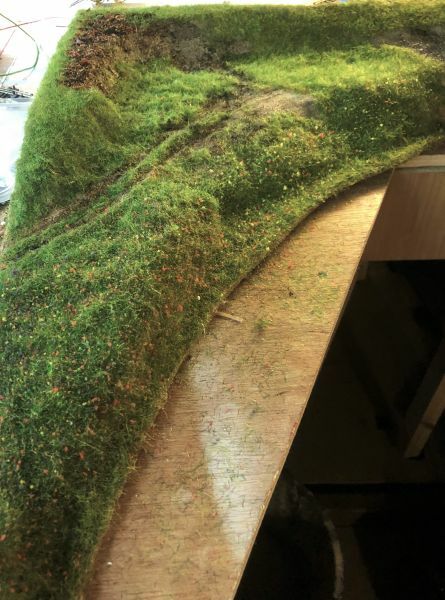 Now, I do a base layer of 2mm grass in any colour. I give it a good coating of glue and fibre, then "scrunch" it up, creating an uneven base. I let it dry then add 4mm and 6mm grass of mixed colours to go over the top of the base. I think it gives quite a natural look. The "flowers" in the scene are home made flock from kitchen sponge. Again, I think the general meadow feel works quite well. 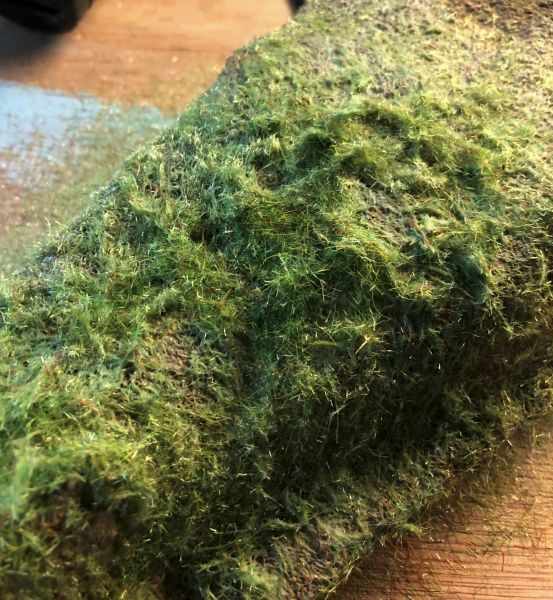 I chop the sponge up and put it through a blender with some water, then take it out and let it dry (a squeeze and microwave speeds up this process). Then I create little pots of the sponge and add some colours to dye it. 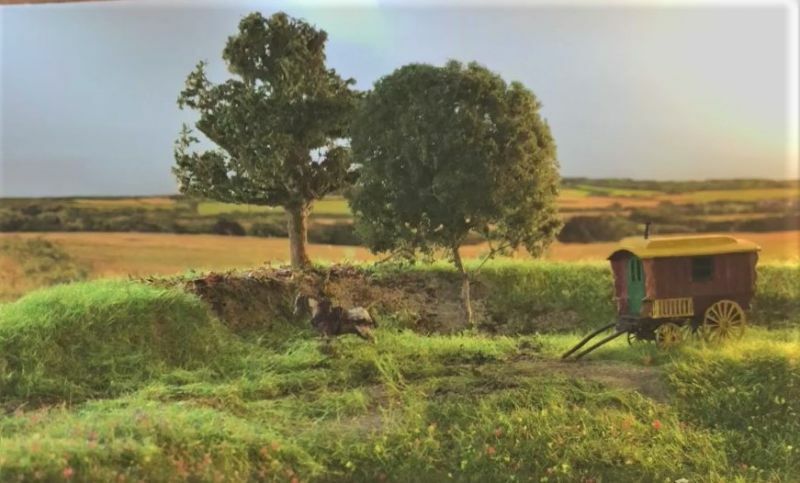 For this scene it is yellow, red and purple - chosen from a photograph of a meadow scene. I scrape the sponge through a sieve to get the pieces as small as possible and just let them fall on the grass. Then I give it all a good coating of cheap hairspray. The scene looks quite soft but is actually as stiff as a board! The hairspray even holds the caravan in place. The trees are from previous modules and I don't know if they will remain or if I will make new ones. The one to the left is made from real twigs from a huge fuschia bush in my garden which are glued together with a hot glue gun to create the shape. In this instance I have added some seafoam to the branches and then added dried herbs (sorry, cannot remember what exactly) for the leaves. Looking at the photo it needs a bit of tidying in places. The other is a seafoam tree with flock leaves added. I am not sure this one will stay in this scene when it is finally fitted in the correct place. A very well put together and believable scene Michael. Your colours are well matched with the backscene too. 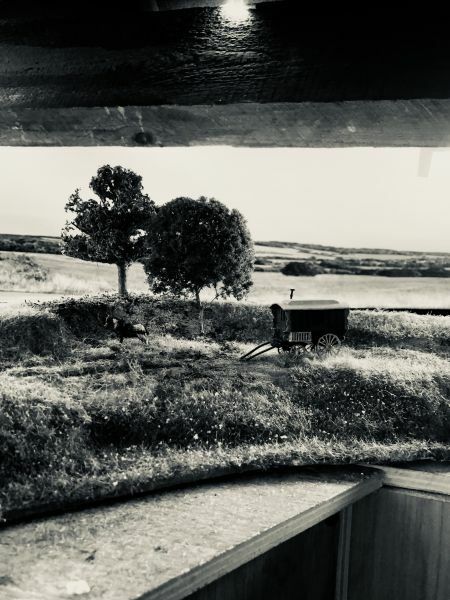 Your practice dioramas have paid dividends.following along. I tried all sorts of things for the stream. Modelling water proved a challenge. I tried, PVA, varnish (which is what is in the scenes above). Eventually settled on a shop product - E Z water, I think it was called. The backscene is just propped up in this photo and was my first prototype for creating a photo backscene by stitching photos together from the internet. That's something I am still trying to do better! Polystyrene added and roughly cut. Thankfully the hot weather means the glue dries quickly! A variety of shades and lengths are added in layers over the top. I experimented with some flowers on this - they got replaced! Just trying to get everything up to date before I go on holiday! 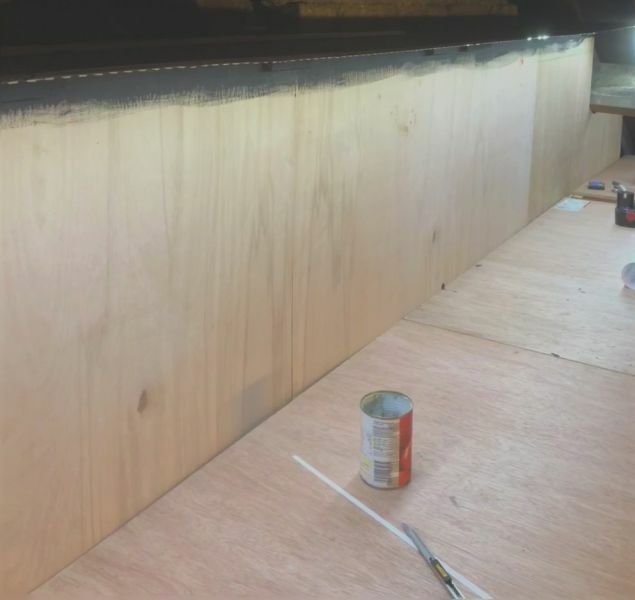 Baseboards for the main scenic areas are built, with the backboards in place and overheard lighting fitted. 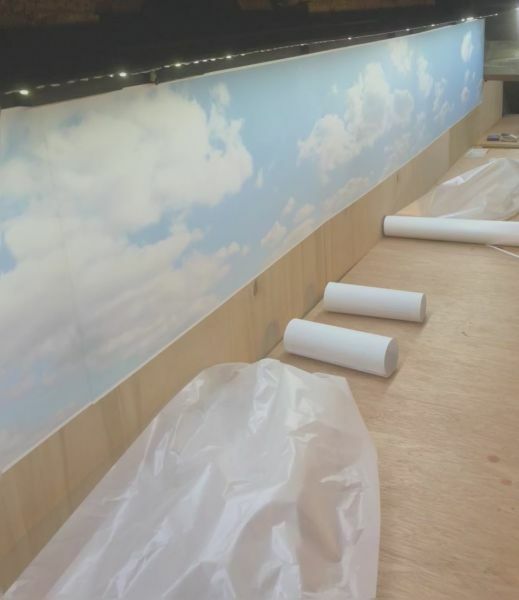 The sky back drop is in place. 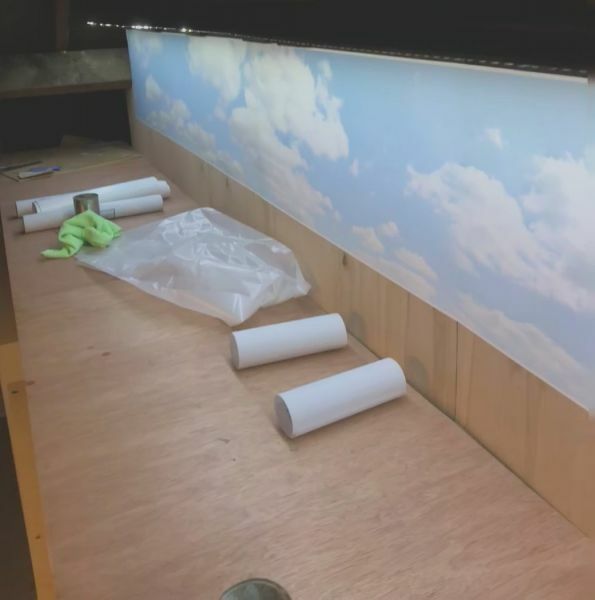 I will be creating my own scenes for the land, and adding terrain, hence the gap! The track plan was printed out and pieced together and transferred to the boards. All the cork bed has now been laid and I have tested the track.... so now it is a case of painting track ready for final laying. I much prefer to paint before laying, even if I have to touch it up again later.... it is so much easier working at my bench rather than on the baseboards. 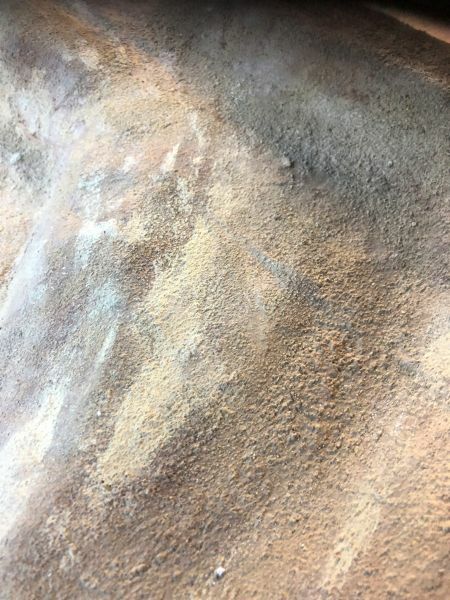 So, I bought some fine brown ballast, trying to get a light brown, rather than dark, but it has a sparkle to it which will need to be toned down a lot if I am to use it. I did a test piece, but I ended up making it look....grey!